Today (Oct. 17), Canada fully legalized recreational marijuana, creating a tremendous opportunity in marijuana penny stocks. That's a major catalyst for an already growing industry as marijuana stocks are one of the most popular assets on the market this year. In a recent report, Bloomberg showed marijuana stocks outperformed gold, Bitcoin, and the market as a whole this year. And marijuana penny stocks have even greater profit opportunity since these companies haven't hit the mainstream radar yet. Plus, pot penny stocks give investors the chance to reap the benefits of this growing industry without spending too much money. This investment strategy doesn't come without risk, however. It's important to remember that penny stock investors should never invest money they can't afford to lose. But with the cannabis industry on the verge of spectacular profit, we want to show you three cannabis penny stocks with serious growth potential. 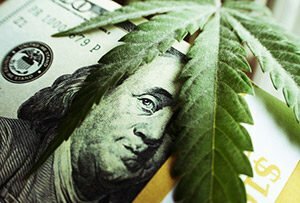 Top Marijuana Stocks Under $5 to Watch, No. 3: GB Sciences Inc.
Based in Las Vegas, GB Sciences Inc. (OTCPK: GBLX) sells equipment used for growing marijuana indoors. Over the last year, GB has announced plans to produce medicinal drugs that use compounds found in cannabis. One central compound is CBD – a cannabis compound that has medical benefits but does not make users intoxicated. GB received a government license to develop CBD products in February. The company also closed a deal with the Colorado Hemp Project that will give GB full access to the key ingredients necessary for CBD development. In March, the company announced it would sponsor a symposium called "Innovation in Medical Cannabis Therapies." This symposium generated a significant amount of investor buzz over GB products and has put the company on the map. Shares of GBLX currently trade for $0.52. However, with interest growing, GB could jump significantly as cannabis legalization sweeps North America. Marijuana Penny Stock to Watch, No. 2: GreenGro Technologies Inc.
Much like GB Sciences, GreenGro Technologies Inc. (OTCMKTS: GRNH) develops cultivation tools for the cannabis industry. On Oct. 11, GreenGro announced it will begin directly manufacturing cannabis consumer goods. GreenGro intends to develop a line of CBD products that can be used in medical facilities, private medical practices, and artisan retailers. By investing in GreenGro, investors can get in on the ground floor of an industry with tremendous profit potential. It's a pure "pick and shovel" play – a firm that serves the pot industry without having a direct hand in growing marijuana or operating dispensaries. Interactive Brokers registered in the Bahamas. They’ll let you trade every exchange and trade dealer network (Market Makers) in the world as long as you have a pulse, money to trade and can prove who you are.